How set is your long term water storage? Can it use a boost or a review based on new information? Why Think About the Long Term Water Storage? Without clean drinking water and long term water storage, human life expectancy drops to around three days. Most of us in first world nations take clean water for granted. However, circumstances may happen in which your household water faucets no longer deliver the precious life-sustaining liquid. While we purchase insurance for unexpected accidents or disasters, many don’t consider taking action to ensure our personal water supply. Fortunately, the long term storage of water is insurance against the unexpected loss of water due to natural or human-made disasters. Tornadoes, earthquakes, tsunamis, and other disasters can conceivably knock out a pumping station with a direct hit. As likely to happen is flooding due to strong storms may contaminate local wells and potable water supplies. Typically the impact of these events last only a few days and do not directly disrupt the flow of water into your home. However, if your water continues to flow, you may be instructed to boil water to cleanse it of impurities for 3 to 5 days until they resolve the problem. Earthquakes, perhaps the worst natural disruptor of water flow, potentially could destroy pumping stations, pipelines, and sewer lines. 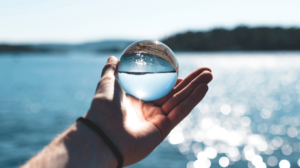 Under such circumstances, household plumbing could be rendered useless for a lengthy period of time, necessitating that people take long term water storage more seriously. When the flow of your water is disrupted, contamination will still be a concern, but if caught unprepared, your focus should be on locating and securing a source of usable water. Human-made disasters can include system failures caused by operator error, on-site accidents, an act of terrorism, war, or civil unrest. Depending on the severity of the damage done, these events could render you waterless for extended periods. Flooding is one of the most common reasons for water contamination, especially after natural disasters. Floods occur around the globe and while most are a matter of inconvenience, the worst-case flood scenarios can bring life-threatening diseases to your water. Some of the diseases that may accompany floods and disasters include typhoid fever, dengue fever, malaria, West Nile virus, cholera, yellow fever, leptospirosis, and hepatitis A. On average, most people drink less than a gallon of water per day. But it’s important to remember that we use water for more than drinking. Our extra use of water means that we should consider the long term storage of water on a larger scale than many people currently do. You will have to determine your daily water usage based on your personal needs along with your speed and efficiency of getting tasks done. These estimates below are based on one person’s typical water use. If you have others to include in your preparedness planning, you’ll need to consider their usage as well. The total estimated daily usage for one person under normal conditions is 127 to 213 gallons. For a family of four that comes out to 508 to 852 gallons. So, if you cook three times a day, then you could consume 3 to 9 gallons of water per day for total cooking. Flushing a toilet three times a day would likewise consume 5 to 12 gallons per day. How Long Can Water be Stored Safely? Regardless of the condition of your public water supply, I recommend that you test your tap water before filling your storage containers. After all, why take a chance with one of your most critical preparedness needs. People who have tested their water occasionally find the presence of coliform bacteria (a.k.a. human feces contamination), in spite of treatment before arriving at their homes. Additionally, some tests may show a high level of rust in the water due to old pipes. In addition to treating your water, I recommend using a home water filter, such as the Big Berkey. 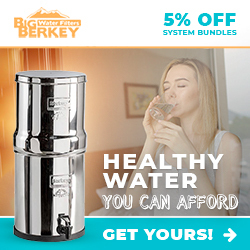 I find the Berkey Water Filter Systems is such a great water filter that I’ve used it for a number of years for all of my drinking and cooking water needs. Heck, even our dogs get Berkey filtered water. Now, in full disclosure, I am a Berkey affiliate and do make a small percentage off any sales through my site. However, rest assured, I would never promote something that I don’t believe in, nor a product that I wouldn’t consider using in my own preparedness. Despite many popular internet offerings, many containers that are marketed for long term water storage work great. The reality is that you do not need a blue drum or a certain type of container. The only true requirement is that the container is free of residual materials (if re-purposed) and free of bacteria, algae, or other contaminants. Heck, many people use two-liter soda bottles to get their budget-minded preparedness ball rolling. HDPE containers are inert and impermeable. They are bisphenol A, or BPA-Free. Because they are inert, they do not react with chemicals or other substances. Being impermeable means that chemicals or odors do not penetrate the container. In other words, you can store them without fear of nasty things leaching into your long term water storage supply. Glass containers are also inert and impermeable, but there is the risk of breakage. Some argue these are not UV-resistant and promote bacterial and algae growth. The truth is, if you store clean water, in clean containers, it should stay clean. The reality is that UV sunlight is an accepted method of inhibiting, not promoting, microbial growth in water. Both the Center for Disease Control and the World Health Organization are clear about the process of using UV light, which is called solar disinfection of SODIS. PET is the recyclable plastic used to make the small-sized, portable water bottles that you find in stores. These typically hold 16.9 or 24 ounces of water. PET is approved by the FDA who states that it is safe for food and beverages. In fact, it is found in many packaging applications for foods and beverages, PET protects items like peanut butter, salad dressing, condiments, and 2-liter sodas. You probably have more options than you realize when it comes to selecting your long term water storage containers. Food-grade plastic containers range from the 16.9-ounce retail water bottles up to 20,000-gallon storage tanks. When it comes to containers, there are some basic issues that you’ll need to work through to maximize your long term water storage preparedness. Most homes have the ability to store water containers in a variety of areas. You can easily start by store water in a cellar, laundry room, attic, garage, or utility shed. Then as your supply grows, you can branch out to storing your water in multiple areas to allow for a more flexible system. If you live in an apartment though, you may have to get creative with your storage. If you do get creative, look at storing cases or water bricks under your bed, under sinks, and in the unused spaces of closets. Some enterprising preppers have stacked cases to use as a table or shelf, covering it with an old tablecloth or bedsheet. Don’t forget to mark your containers with the date filled, when storing them. Doing so will help you rotate your water in an efficient and effective manner. Small bottles in the case are stackable, easy to date and rotate, and portable. One gallon jugs are portable and easy to date/rotate, but not stackable (unless boxed). 3.5-gallon Water Bricks are portable, stackable, easy to date and easy to rotate. Five-gallon bottles are portable, easy to date/rotate but are clumsy and not stackable. 7-gallon Aqua-Tainer jugs portable, easy to date/rotate but are not stackable. 55-gallon drums can be stacked if you’re equipped properly. They are also easy to date, but are less portable and less easy to rotate. Most households do not have space for larger containers, but it is good to know they exist as food-grade, UV-resistant, water storage options. Determining the correct amount of water to store and selecting appropriate containers requires you to examine your current usage and use that to estimate your usage during an emergency. Taking the time to plan, prepare, and make the proper call about your long term water storage now, can save you when disaster strikes. I say be aware and get informed. If you have any other thoughts or questions about the long term water, please leave a comment below. Thanks for reading to this post about the long term water storage?